This is Part II of my response to Penelope Trunk's post on “How to Manage an Education.” In my last post, I talked about why you shouldn't count campus career centers out. Today, I want to address Penelope's assertion that career centers cater to companies not candidates, and that one of the primary examples of this is found in the entry-level resume since most colleges endorse and teach students to write resumes using a standard format. I'm going to tackle these opinions one at time. On the Statement that "career centers cater to companies not candidates"
Career Placement: Focus of office often more heavily skewed towards providing employer services and connecting students with advertised opportunity. They have specific, pre-defined roles they are looking for. They recruit at more than one campus. Most college career centers do arrange their services to meet the needs of these employers. Again, often their budgets depend on it--and students generally want to be able to interview for jobs. Most colleges endorse and teach students to write resumes using a standard format. Need to update your resume so that it's scannable and passes the relevance test? 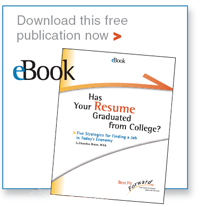 Check out my e-book, Has Your Resume Graduated from College?